Liv arrived home from 6th grade camp a week ago bringing with her stories of starry skies, afternoon hikes and new friendships. In addition she brought a sniffly, yucky cold. Taking a much earned day off of school she informed me that hot chocolate would most definitely make her feel better. A few years ago a friend gave us some packets of Hot Chocolate Mix for Christmas and Liv has always remembered those little powdery packets fondly. I, however, gained somewhat of a different opinion after reading the labels and not being able to identify a few of the ingredients. Filled with sugar and hydrogenated oils, I have refused to buy them for her again. Luckily, Liv remembered a Girl Scout project we did making our own hot chocolate mix and we decided to alter it to make it peppermint (good for the cold I was told...). A little internet research turned up a number of recipes for hot chocolate mixes, but we decided to stick to our Girl Scout recipe that we have been using for years. A simple one to one mix of unsweetened cocoa, sugar (sometimes we use Splenda), grated dark chocolate, a dash of salt and a little scoop of cornstarch (Alton Brown's idea!) mix together for a nicely balanced, silky cup of steamy Hot Chocolate. For the peppermint, the general consensus seemed to be crushed candy canes, bringing a big smile to my sniffly girl's face. We usually make this mix cup by cup, but the concoction works wonderfully layered in a pretty jar and tied with a ribbon as a holiday present, or maybe for a sick neighbor who needs a warm cup to ease a few aches or a stuffy nose. As pretty as the crushed candy canes are to layer, we tend not to put them in the jars as they seem to get a bit sticky over time. We simply tie a couple of canes onto the jar and attach a short recipe. Sure to bring a smile to the recipient's face, this easy holiday treat is not only tasty but fun to make! Pour the milk into a small pot, heating over medium/medium low heat. Add the remaining ingredients, whisking to dissolve. Continue stirring as the chocolate milk heats until desired "hotness". 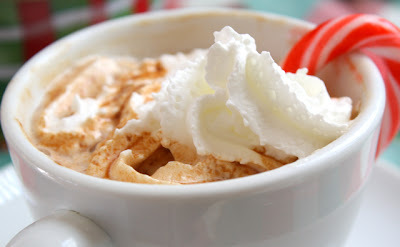 Serve in a mug and top with whipped cream or a handful of marshmallows! Note: To layer into a jar simply adjust the ingredient measures equally. Include directions on a little card to use 2-3 Tbs of the mix per cup of milk. The candy cane may be crushed or used to stir. Enjoy! I am sorry that Olivia has a cold, that is no fun. Lucky for her she has a wonderful mom who makes yummy things to make her feel better. I love the photo of the cup with the candy cane hanging from it. Great gift idea! I can't wait to make myself a nice hot cup! Such a GREAT idea. It sounds delicious and perfect for winter. 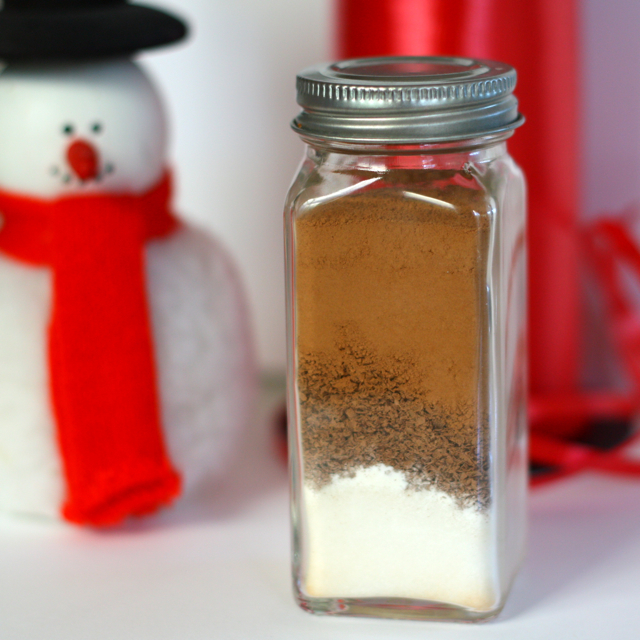 So adorable in the little shaker too ... this would be such a cute holiday party favor! I'm saving this one! Hope that Liv is feeling better. This hot chocolate mix sounds wonderful, especially with the addition of peppermint. Sounds so good! Just perfect fot these cold days we've been having lately. lets hope that wonderful hot chocolate works its magic with Liv! She looks much too happy to be too sick, especially this close to Christmas! A wonderful treat for the sniffles or for giving as gifts. I make my own hot chocolate with a little cocoa and alternative sweetener, but I've never tried to quantify what I do. Thanks for sharing your recipe. just the thought of this makes me smile! 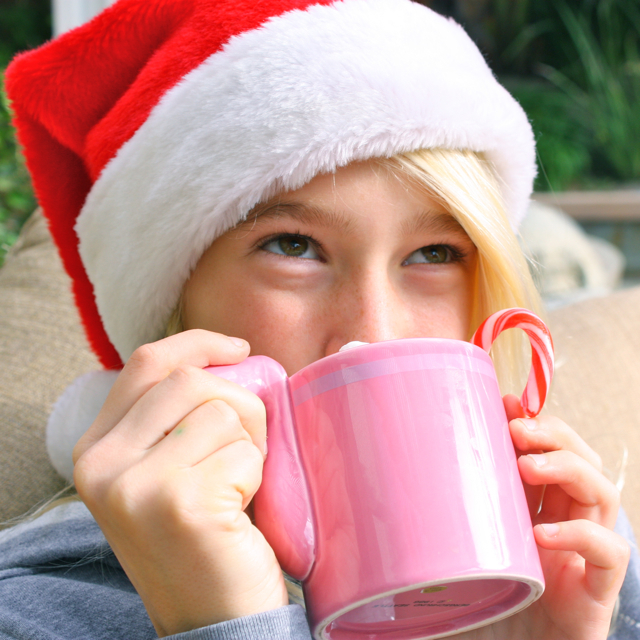 Peppermint hot chocolate is just my favorite! Thanks for sharing the recipe! This is such a great idea. I can't wait to make it when the family's in town. Sounds delicious. I especially like that you can use sugar alternatives in it. Mint and chocolate is a great combination! Kim-What a wonderful treat-would even make a nice Christmas present with a fancy bow around the jar. Hope Live feels better by now...we are getting quite cold weather here as well in S. Florida, and you amazing mix would be a nice treat here, as well! Wow - I could use a vat of that right now. 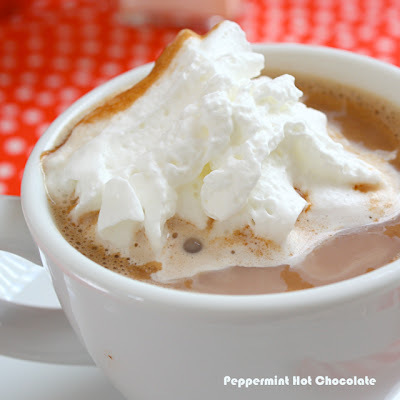 It's been gray and rainy here for days, the perfect weather for a steamy cup of peppermint hot chocolate. If this doesn't get you into the holiday spirit you might want to check and see if you are related to Heatmeiser! This looks beautiful. I can see why it would make Liv feel better. I hope she gets well before Christmas and can enjoy her school holiday. I have to agree with Liv, hot chocolate scares the cold away. I've been sick for the last couple of days and since I'm not a big tea or coffee drinker a warm cup of milk and some chocolate shavings cheered me up. Next time I'm in the mood for some hot chocolate I'll give your recipe a try. I love peppermint hot chocolate mix, and I agree with Miss Liv...it will definitely help fend off any cold you might have during the holiday season. ;-) Love your pictures, they are great! I'm so sorry she has a cold. :( All that excitement and crappy food didn't give her much nutrition did it?? That Alton Brown has some good ideas! Thank you for this incredible recipe. We will have to give this one a try.